Appendices, including a glossary, a flame arrester specification sheet for vendor quotation, and a listing of flame arrester manufacturers. 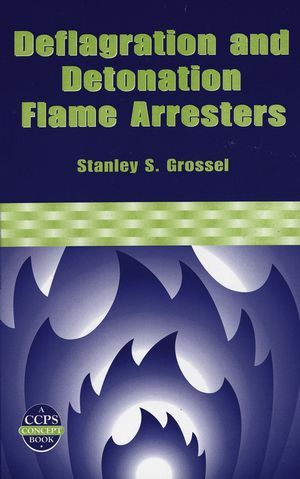 Stanley S. Grossel is the author of Deflagration and Detonation Flame Arresters, published by Wiley. 1.2 Why This Book Was Written. 1.3 What Is Covered in This Book. 1.4 What the Reader Should Learn From This Book. 2. History and State-of-the Art. 2.1 Historical Development of Flame Arresters. 2.2 Case Histories of Successful and Unsuccessful Applications of Flame Arresters. 2.3 Evolution of Standards and Codes. 2.4 Safety Concerns and Environmental Regulations: Tradeoffs and Conflicts. 3. Overview of Deflagration and Detonation Prevention and Protection Practices. 3.2 Deflagration and Detonation Flame Arresters. 3.8 Equipment and Piping Isolation. 4. Overview of Combustion and Flame Propagation Phenomena Related to DDAs. 4.1 Introduction to the Chemistry and Physics of Flame Propagation. 4.1.1 Combustion Chemistry and Thermodynamics. 4.2 Dynamic of Flame Propagation. 4.2.1 Burning Velocity and Flame Speed. 4.2.2 Flame Acceleration and Deflagration-to-Detonation Transition (DDT). 4.4 Theoretical Basis for Flame Arrester Design and Operation. 5. Deflagration and Detonation Flame Arrester Technology. 5.1 Where Flame Arresters May Be Needed. 5.2 Types of Flame Arresters. 5.2.10 Hydraulic (Liquid Seal) Flame Arrester. 5.2.11 Packed Bed Flame Arrester. 5.2.13 High Velocity Vent Valve. 5.2.14 Conservation Vent Valves as Flame Arresters. 5.3 Selection and Design Criteria/Considerations. 5.3.1 Classification According to NEC Groups and MESGs. 5.3.2 Reactions and Combustion Dynamics of Fast-Burning Gases. 5.3.4 Quenching Diameter, Quenching Length, and Flame Velocity. 5.3.7 Fouling and Plugging Potential and Protection. 5.3.13 Operating Temperature and Pressure. 5.3.15 Changes in Pipe Diameter. 5.3.19 Inspection and Maintenance Requirements. 5.5 Information That Should Be Provided to Manufacturers. 6. Installation in Process Systems. 6.1 Design Considerations with Respect to Other System Components. 6.2 Piping and Flame Arrester System Design Considerations. 6.4 Optimum Location in System. 6.5 Supports for Static and Dynamic Forces. 7. Inspection and Maintenance of Flame Arresters. 7.1 Need and Importance of Maintenance. 7.2.3 Documentation and Verification of Flame Arrester Maintenance. 7.3 Training and Competence Issues for Operating and Maintenance Personnel. 7.4 On-Stream Isolation and Switching of Parallel Spares. 7.5 Check List for Inspection. 8. Regulations, Codes, and Standards. 8.1 Regulations, Codes, and Standards Summaries. 8.2 Comparison of Various Flame Arrester Standards and Codes. 8.3 Standards and Codes in Preparation. 9. Illustrative Examples, Calculations, and Guidelines for DDA Selection. 9.2 Example 1-Protective Measures for a Vent Manifold System. 9.3 Example 2-Sizing of an End-of-Line Deflagration Flame Arrester. 9.4 Example 3-Calculation of Limiting Oxidant Concentration (LOC). 9.5 Example 4-Calculation of the LFL and UFL of Mixtures. 9.6 Example 5-Calculation of the MESG of Mixtures. 9.7 Determination If a DDT Can Occur. 9.8 Typical Locations in Process Systems. 9.9 List of Steps in the Selection of a DDA or Other Flame Propagation Control Method. 10.1 Status of DDA Technology. 10.3 Why Flame Arresters Fail. Appendix A. Flame Arrester Specification Sheet for Manufacturer Quotation. Appendix B. List of Flame Arrester Manufacturers. Appendix C. UL and FM Listings and Approvals. Appendix D. Suggested Additional Reading.